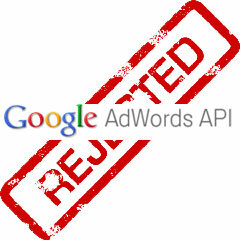 Yesterday we reported on developers complaining their AdWords API tokens were not working any more. Truth is, this is a wide spread crack down by Google. An AdWords representative, I've confirmed the identity to be true, commented explaining this is part of their quality checks and thus have disabled many developers from using the AdWords API. We disabled some AdWords API Developer tokens on 9/12 as part of our periodic review of AdWords API activity. We have done this to ensure quality, improve Google products and services and compliance with AdWords API Terms and Conditions. If your token has been disabled and if you wish to re-apply for the token, please visit the AdWords API Center in your account. a) Describe the uses of your API application or tool with specific examples. For instance, account management or bid optimization. b) Who is or will be using your API application or tool? For example, colleagues in your company or advertisers or agencies to whom you are selling the tool. c) Please attach screenshots of your API application or tool. If the application or tool is yet to be developed, please provide relevant design documentation. d) Please provide a list of clients that will be using your API application or tool in an automated way. Obviously, this is not going to be fun for those who were disabled that need to run their campaigns daily and are losing customers, business and money.